If you've been following along with my party adventures, you know that I love to put fun twists on every day party themes. You may also know how much I love mixing patterns: such as polka dots, and stripes. This 'Donut Pinch Me' St. Patrick's Day party was no exception! I wanted to get playful with the Donut Pinch Me theme while staying familiar with the color green, shamrocks, and pinching... or lack there of! And there are lots of us who love donuts! Our sweet friends over at Swish Printables helped create and customize a really fun printable package, based on details I gave them about our Donut Pinch Me theme. We instantly fell in love with their creations, and couldn't be happier with the results! We had a cute table sign made up that said, 'Please Donut Pinch Me'. I spray painted an Ikea frame with Rustoleum semi gloss black spray paint, to coordinate better with our party decor. I added favor tags, and bottle wraps to black gable favor boxes from Shindigz. It's so easy to dress up boxes & containers to fit any party theme. We took plastic milk bottles from Hoopla Events, and decorated them with bottle wraps, a paper straw, and straw flag! Swish Printables was also kind enough to creaete a couple photo props for us. My boys love, and I mean LOVE to play with my photo props. I knew they would really enjoy the shamrock, and large donut! I love having a mixture of different patterned paper straws for my parties, and almost always display them in one of my special painted Mason jars from Just Add Glitter By Marla. The green and black straws pop with color + fun patterns, and look festive with coordinating straw flags. Next we wanted some sweet treats that would also coordinate with our specially designed Donut Pinch Me printable set. I contacted Sweet Talk Bake Shoppe to see if they could squeeze in a last minute order for us. I sent over a sample of the printables, and she let her creative juices do the rest. We also had some mini donuts, popcorn displayed in playful striped containers, and sweet store bought cupcakes. I cannot begin to tell you how adorable these Shamrock and Donut cupcake toppers turned out! Creativities Galore always creates the most darling toppers for me. I also took her shamrock toppers and attached some of them to our striped popcorn boxes. I added some striped, and polka dotted paper lanterns above our party table for a little extra fun! And attached the 'Donut Pinch Me' banner to the front of the lanterns. We placed polka dot napkins and added a bottle wrap to them. They were set on each plate, along with a cookie favor packet. Now for the fun part! Swish Printables has added the entire printable set to her shop!! They are offering these darling printables to my fabulous readers! In fact, she added a few more fun designs than what you've already seen here. But wait, there's more! She's giving you guys 40% off if you order soon. Wow! That's a pretty sweet deal, don'tcha think? Just enter the code during checkout, in the coupon code field! 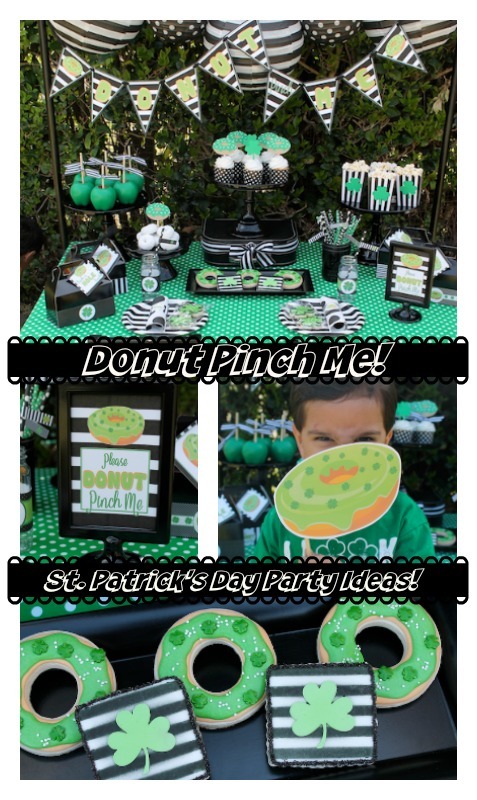 I hope you like our 'Donut Pinch Me' St. Patrick's Day party inspiration! I'd love to see what fun pinch free ideas you come up with! Looking for more party ideas with a fun twist? Check out our Pirate themed Valentine Party! 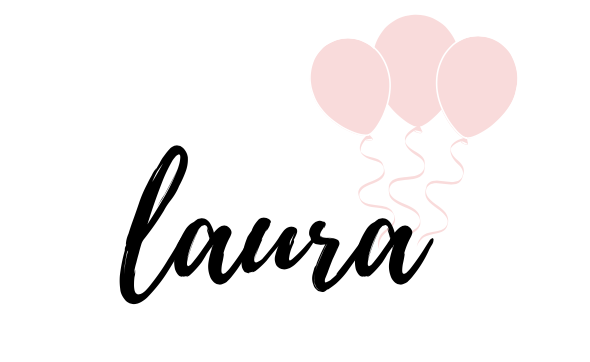 This is so cute, Laura! It looks like the perfect St. Patrick's day party.